This page was made with very old photo of my Dad and my baby sister, about 40 years ago. My Dad's smile is still the same, not his health, not anymore… I made a b/w page with just a bit of inking and one colored vellum piece and changed the glitter die cut piece to more reddish look to fit the same reddish color using Puffy ink. What a wonderful picture to have of you and your dad. Your layout is stunning and so full of love. Beautiful paper! I love red with black and white. Gorgeous layout, Irit! 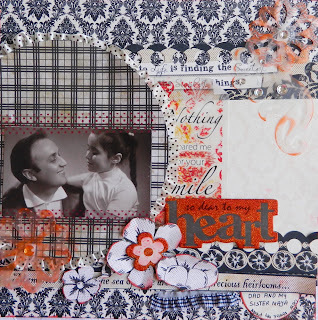 The photograph is so sweet and I love the mixture of patterned papers. You do such beautiful work! This is a stunning layout!